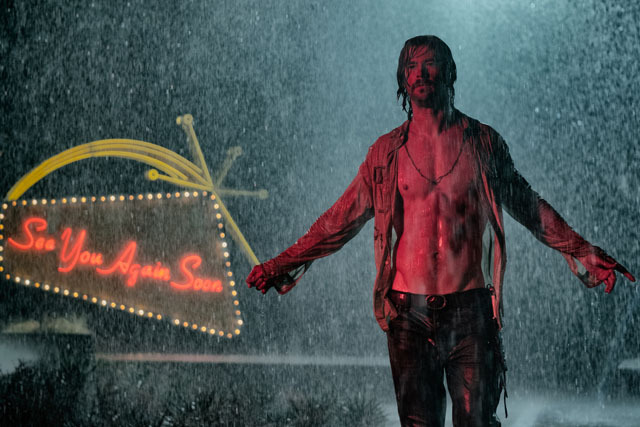 The secrets of seven strangers are teased in the new trailer for Bad Times at the El Royale. Drew Goddard’s (The Cabin in the Woods) latest film features an ensemble cast including Jeff Bridges as Father Daniel Flynn, Cynthia Erivo as Darlene Sweet, Dakota Johnson as Emily Summerspring, Jon Hamm as Laramie Seymour Sullivan, Cailee Spaeny as Emily’s sister, Lewis Pullman as Miles and Chris Hemsworth as Billy Lee. The new trailer sees the seven central characters check into the El Royale, which sits on the border between Nevada and California. Hemsworth plays a charismatic cult leader and it looks like he could be (one of?) the villain(s) of the film, playing against type. From the look of the latest trailer, you can expect intrigue, twists and plenty of violence. Bad Times at the El Royale looks an absolute hoot. Bad Times at the El Royale is released in cinemas on 12th October 2018.